The rise of 4K (and 6K… and 8K) video, not to mention virtual reality and 360° content, means the computers of today need to grow up and they need to do it fast. 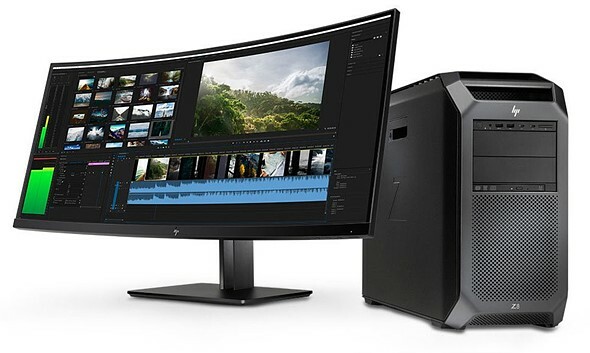 16GB of RAM, a decent video card, and 1TB of hard drive space just won’t cut it for many professionals any longer… but even those professionals who need boatloads of power will probably go wide-eyed when they hear the specs of HP’s new top-of-the-line desktop workstations. Inside this mammoth of a PC you will find dual Intel Xeon CPUs with up to 56 processing cores, which are running your real-time 8K video editing session off of up to 3 terabytes of RAM. That is not a typo. You also have access to 9 PCIe slots (7 full size, 2 ‘personality’ slots), dual 1GbE Ports, Thunderbolt 3 (optional), and USB 3.1 G2 Type C ports as well. The fully spec-d out Z8 is probably out of reach for many creatives, which is why there’s also a Z6 and Z4. These workstations can’t handle quite as much in way of raw processing power, speed, and storage, but they’re still extremely capable machines. The Z6 also sports dual CPUs, can handle up to 384 GB of system memory, and features dual M.2 slots for HP’s own Z Turbo Drive PCIe SSDs. The Z4 is a bit weaker still, housing only a single Intel Xeon W CPU, 256GB of RAM, as well as dual 1GbE ports and dual M.2 slots. The Z8 and Z6 will both be available in October, with the Z4 following shortly after in November. You can get the base model Z8 for just $2,440 but don’t expect that to be a fully upgraded version… for that you’ll likely need to shell out many thousands more. In contrast, the Z6 will run you $1,920 for the base model and the Z4 will cost $1,240. To learn more, head over to HP’s website and have your bib ready… something drooling this way comes.